Tagged Image File Format, abbreviated TIFF, is a file format to store graphics or images. PDF is the most common format we use to receive files online. Any images received in PDF files, need to be converted to TIFF format to get high color depth images. PDF to TIFF converter is a tool that can convert your PDF file to TIFF format with convenience. This ultra-fast tool can convert PDF files in no time. This tool is very simple to use and does not need any technical expertise. So download PDF to TIFF Converter and convert the files like a breeze now! This tool offers a brilliant feature called folder monitoring feature. You can make tabs of a folder and can keep them alive in this program. Whenever you add a PDF file to that particular folder, it will be converted into TIFF format. PDF to TIFF Converter has been designed to provide an elegant look. It is a simple tool, with few options so that users can understand it with ease. As soon as you open the program, you will see two main options. First will let you choose the desired PDF file and the second option will enable you to select the destination folder. This tool has been designed to convert PDF files to TIFF format. But, it can do more than this for you. You can also select other formats like JPEG, PNG and PNG grey for your output file. If you do not want to convert the whole PDF file then this tool should be your choice. You can select the pages from PDF file, for example, the first and last page. Only the selected pages will be converted. 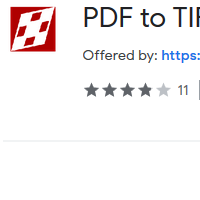 So download PDF to TIFF Converter and stop wasting your time in testing other tools now!